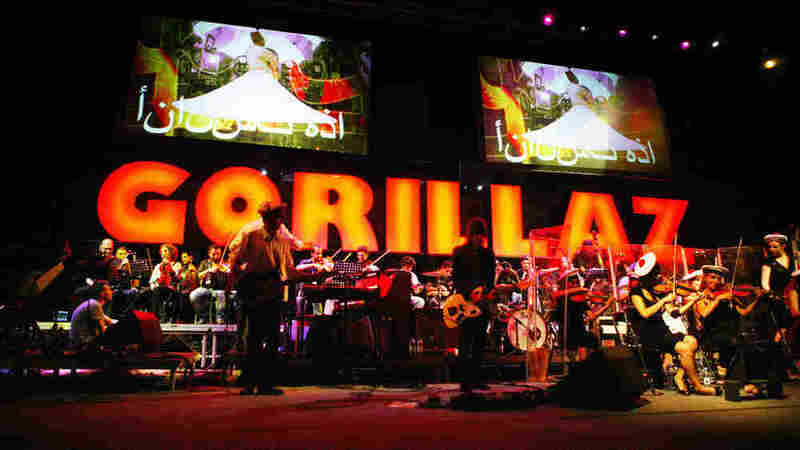 Gorillaz, Recorded Live In Damascus Listen as Damon Albarn and the cartoon-intensive cast of Gorillaz's new album Plastic Beach perform a historic concert with the Syrian National Orchestra for Arabic Music. 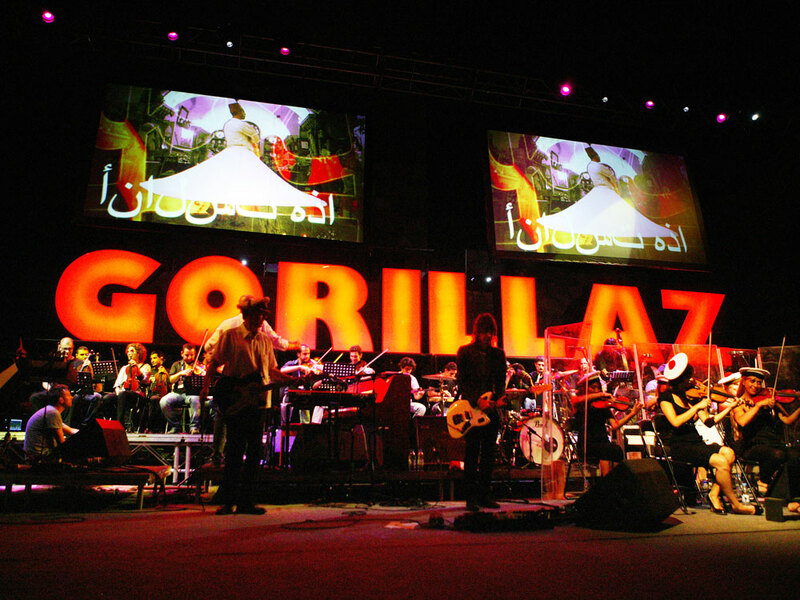 Gorillaz onstage at the Citadel of Damascus, with Syria's National Orchestra for Arabic Music. "Welcome to the World of the Plastic Beach"
What you are about to hear is the sound of a band coming full circle while embarking on a new beginning. When Damon Albarn decided to extend his Gorillaz project for a third album, he looked to Syria for inspiration. It was March 2009, and the Britpop icon was obsessed with Arabic orchestral music, so he took his demos to Damascus and recorded with the National Orchestra for Arabic Music. While in Syria, Albarn worked with conductor Issam Rafea, who composed a gorgeous piece full of strings, woodwinds and hand percussion for Gorillaz's third album, Plastic Beach. The sessions only resulted in the intro and outro of "White Flag," the album's not-so-ambiguous plea for peace in the Middle East, but those two minutes helped cement the relationship Rafea and his musicians had with Albarn. Just look at what happened on Sunday night. Gorillaz returned to the Syrian valley with Plastic Beach's cast of all-stars in tow for a special performance at the Damascus Citadel, a 1,000-year-old walled palace in the northwest corner of the city. Under a full moon, the cartoon crew — stripped of its members' animated alter egos — shared the stage with Syria's National Orchestra and marked what we can only hope is a new era of music in the Middle East. "The pinnacle of our exploit," Gorillaz bassist Murdoc Niccals tells NPR Music in a rambling introduction to the concert. "It shows that it is possible to perform there. This shouldn't be a one-off gig — it should be the start of many, many bands going over there." This wasn't the first time Rafea's orchestra played live with Gorillaz — the band brought it along to festival performances in Spain, Denmark and Glastonbury, England — but it meant so much more this time around. Rafea got to showcase his composition from the podium in an extended intro to "White Flag," complete with British MCs Bashy and Kano. 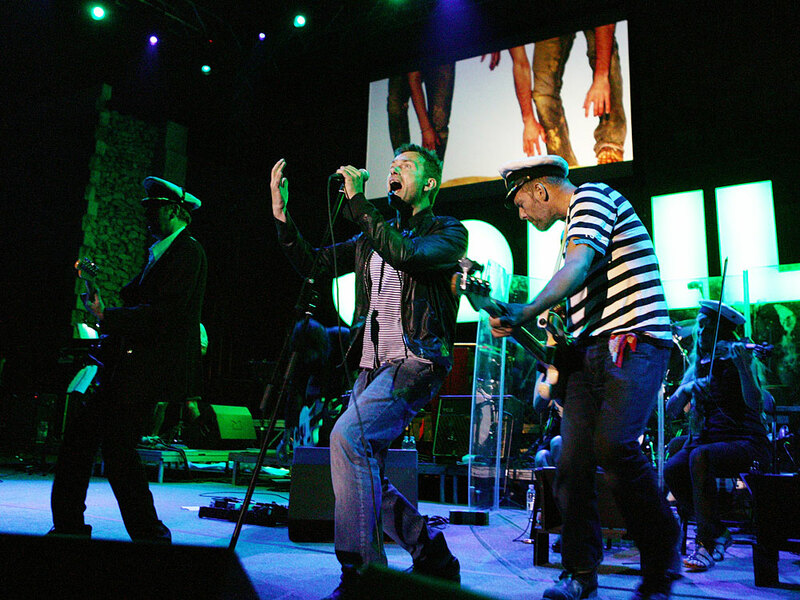 Gorillaz's members, including Blur's Damon Albarn, perform without their typical cartoon disguises. The most important guest, however, might have been Eslam Jawaad, the Syrian rapper whom Albarn met in London and worked with in The Good, The Bad and The Queen. Murdoc Niccals credits Jawaad with bringing Gorillaz to Damascus, and the rapper is billed as an inspiration in Plastic Beach's liner notes under his given name, Wissam Khodur. When he launched into Arabic in the show-stopping "Clint Eastwood," the thousands of screaming fans reacted as if they'd been waiting all their lives to hear it. It's a truly magical moment. May there be many more like it to come.